The Culture Story (TCS) is rolling out a new series of talks, “Salon Saturday @ TCS” to equip aspiring art collectors, new buyers and art lovers with the confidence and practical tips to make the best start on their personal journey in art collecting. 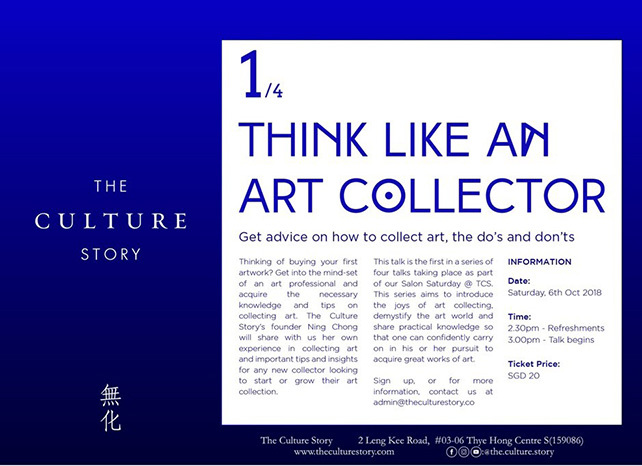 Salon Saturday @ TCS will begin with “Think Like An Art Collector” on Saturday, 6th Oct – why start collecting art at all? Where does one begin and how? What does it mean to be a collector? From the perspective of a young art collector and someone who has a decade of experience in the art world, Ning Chong will share professional knowledge and market insights to set you on the right footing.